In the wake of the Orlando massacre of 49 LGBT victims, an altar has sprung up in San Francisco, on a corner outside of Bank of America, in San Francisco’s Castro neighborhood. 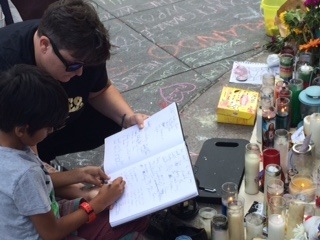 The altar is nearly 1/3 of a block long, the names and ages of the dead scrawled in chalk along the sidewalk, with words such as sister, brother, and in spanish, tio, tia, (aunt, uncle), family, community, and finally Orlando Strong! A few days after the chalk was drawn photographs of the victims appeared—ranging in ages from eighteen to twenty to early thirties. Smiling, playful photos of each of those who passed, bringing to life the horror and magnitude of what has transpired once more in our nation. Pedestrians, gay and lesbian mothers and fathers with their children in tow, stop and read quietly, leave a candle, a prayer, a note, a bouquet, a rainbow ribbon that’s black on one side, the latest symbol of Orlando’s tragedy. The debate over whether this was a hate crime, or just an assault against “Americans” seems a moot point—it is both a crime against humanity, a crime against those who chose to love differently, those with gender identity differences, and just a plain crime crime. While the majority of the Republicans bow to the wishes of the NRA, once more, refusing to pass background check laws or reasonable common sense gun control laws, the people of this country clearly have had enough. It would be nice to think that the victims of Orlando and all those who came before will be our last innocent gunshot victims.